Recently, the state has enacted Ropeway Act and promulgated Ropeway Rules. It is now possible to install ropeways in the state. The Department has identified eight important tourist points located at various deatinations. As per the list below. The state government has recently promulgated a ropeway act and ropeway rules facilitating establishment of ropeways . These will help visitors commute betweeen popular destination as well as provide them with a thrilling experience. 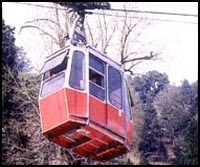 Estimated cost of ropeway is likely to be Rs.10 lakh -Rs. 15 lakh per kilometer.